Private Workout How does it work? Open to men and women aged 12 to 100. What is most important to you in a fitness center, the size of the facility, the variety of activities, the social aspects, or the RESULTS. Private Workout is for people that value results. More private than a "Women's Fitness Center" or a "Men's Fitness Center." Would you rather workout watching others workout, or watching yourself in a mirror, perfecting your form, in a private room? 3) THE BEST 25 MINUTE WORKOUT. 4) NO WAITING FOR EQUIPMENT. Who wants to wait? Our system eliminates most waiting, allowing you to do three times the workout done in a large gym, in one third the time. 5) THE BEST EQUIPMENT AVAILABLE. 6) KNOW WHAT TO DO FOR YOU. Unlike most gyms, which are basically "do it yourself" places, we give you a STRUCTURED training program developed by Personal trainers so that you get the fastest results with the least amount of wasted effort. Most people who have joined gyms never saw results. We offer MEASURABLE RESULTS! WHERE? Dallas, Plano, Las Colinas. and Flower Mound. HOW? A regimented full-body 25 minute workout doing up to 700 repetitions at a heart rate of 155 beats per minute. WHAT ? Fitness evaluation, goal setting and detailed WORKOUT PLAN designed by Certified Personal Trainers. GOT ANY QUESTIONS? When you call our stores, you are talking with personal trainer, not a sales rep, so give us a call! HAS YOUR METABOLISM SLOWED DOWN? The average person will lose up to 1 lb of muscle per year from age 20 to age 40 which causes your body to demand fewer and fewer calories, resulting in the average person being overweight and flabby by age 40. Some people say "I'm just getting older," or "my metabolism is slowing down," the truth is, both of these are the result of muscle loss! Studies have shown that even those doing aerobic excercise and running have lost the same muscle mass as those who "sat on the couch." Adding strength causes you to add muscle, if you add muscle and you RAISE YOUR METABOLISM and burn more calories every day regardless of what you do all day. If you burn more calories you lose fat! Lose fat and add muscle tone and YOU LOOK GREAT! DON'T WORRY- only men "bulk up" when they add muscle. If you add back just the muscle you have lost since you were 20, your body can burn as many calories as it did when you were 20! At Private Workout, our Personal Trainers have created a special program designed to take the guesswork out of getting results. THE PRIVATE WORKOUT is a FULL BODY workout where you will do 3 times the workout in one-third the time. A normal gym takes 90 minutes for you to do 30 minutes of cardio and 160 weight training repetitions. Here you will do a planned, regimented, and structured 25 minute PRIVATE workout, 2-3 times/week on bio-mechanically-correct weight machines, with no waiting, no one watching. You will do 500+ weight lifting repetitions and approximately 30 minutes of cardio (rapid heart beat), but it takes just 25 minutes! In the same time it takes to "warm up" at your old gym, you will also get a muscle-mass and bone-mass building full-body workout . This will RAISE YOUR METABOLISM so it burns more fat even when you are sleeping than you do today. Our PERSONAL TRAINERS will instruct you through the first workout to insure your understanding of proper form and procedure of this program, to custom fit each piece of equipment to your body, and they are available for free consultation thereafter when they are not training others! The Gut-Buster Boot Camp is designed for people that want overall fitness and weight loss. It will build muscle mass, which raises metabolism, so your body will burn more calories 24 hours per day. It consists of one workout with a personal trainer, a fitness evaluation with goal setting, a workout plan developed for you, and you may then workout on your own, as long as you follow the workout plan as designed. CAN YOU GO ALL THE WAY? IT'S NOT EASY! Other plans available on our SPECIALS page. 1) DIGNITY: no one here judges your outfit, your physique, or your workout! When you work out, would you rather watch other people working out, or perfect your workout form in a mirror? 3) BETTER WORKOUT: In our private rooms, you can follow our innovative workout plan without peer-pressure, thus giving you the best possible workout! 4) NO DISTRACTIONS: often other people in the gym will engage you in conversation when you are working out in a "public" gym, which slows your workout down and lengthens it beyond the time you planned to spend. At Private Workout, you are in a separate room for each piece of equipment, by yourself, so you will not be distracted. 5) ORDER OF WORKOUT: in a "public" gym, there is no discipline in their resistance training circuit, so anyone can jump in front of you on the next piece of equipment. There is a correct order for workouts, but it would take a very long time to use the equipment in a "public" gym in the correct order. Instead, most people "skip around" to various pieces that are open, and often completely miss doing the "popular" machines, since they are always busy. We have designed "The Intelligent Closed Circuit®," a copyrighted floorplan which works out everyone in the optimal order and NO EQUIPMENT IS SKIPPED! 6) SPEED: at a "public" gym, it takes a long time to get through a circuit of weight training. 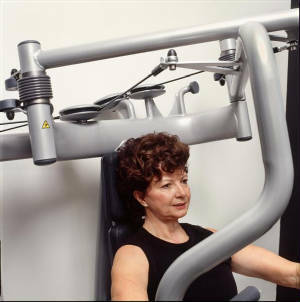 Some people do 1 set of 10 reps, some do 3 sets of 10 reps, some just sit on the machines and rest. At some busy gyms, you have to wait for each piece of equipment! It can take up to 45 minutes to get through one circuit. At Private Workout, because our equipment is all in separate rooms, and because each person moves to the next room at the same time, there is NO WAITING for equipment, therefore our circuit only takes 20 minutes to complete once. We REMOVE THE ROADBLOCKS to your workout. 91% or our customers come to us after having a membership at a large gym where they worked out 90 minutes per day, three days a week, for around 13 weeks, and then quit. The fact is, it is IMPOSSIBLE for most people to reasonably fit three 90 minutes workouts in each week. Out of every 100 new gym members to a large gym, over 97 have stopped working out by the end of 13 weeks. With a shorter workout, most people stay much longer, resulting in better results! Big gyms rarely show you how the use the equipment, nor do they give you a workout plan. We do both. Dr. Kenneth Cooper did a study on running vs. walking, where he asked two groups of identical health to run or walk 1.5 miles per day for 13 weeks. At the end of the study, they found that the cardiovascular health of the two groups was equal, yet the runners LOST WEIGHT while the walkers did not. We conclude something else from this report. The walkers took around 36 minutes to go 1.5 miles, while the runners only took around 12 minutes to go the same distance, yet saw superior results. We concluded from this that if we could do the "public" gym 90 minute workout in just 20 minutes, we would see superior results as well, and we have! The medical journals say that a person can add 6 lbs of muscle per year, on average. We have people that have added 16 lbs in 6 months, a rate 5 times faster than the norm! The faster you add the muscle, the faster the fat is burned! 30 min on a treadmill, taking 15 min to get your heartbeat into the cardo zone (121 to 170 beats per min) results in just 15 minutes of true cadio exercise. 25 min doing 500 reps at 155 heartbeats per minute. Note, your heartbeat stays elevated for up to 10 minutes after you have completed the The Private Workout System.